add check box on the bottom panel for quick access as suggested by leongster. what is the velocity of the projectile if it is launch horizontally at the surface of the Earth? hint: use circular motion equation to find the v! 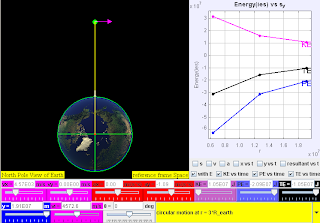 An object projected horizontally near the Earth’s surface follows a parabolic trajectory. As the velocity of projection increases, there will be an occasion in which the trajectory follows the curvature of the Earth’s surface. If air resistance is negligible, the object will orbit round the Earth and will never meet the Earth’s surface. speed of cannonball at 0 km/hr launched horizontally from newton's very tall mountain, resulting in trajectory that hits Earth surface. tall mountain, resulting in trajectory that hits Earth surface. tall mountain, resulting in trajectory that does NOT hit the Earth surface. 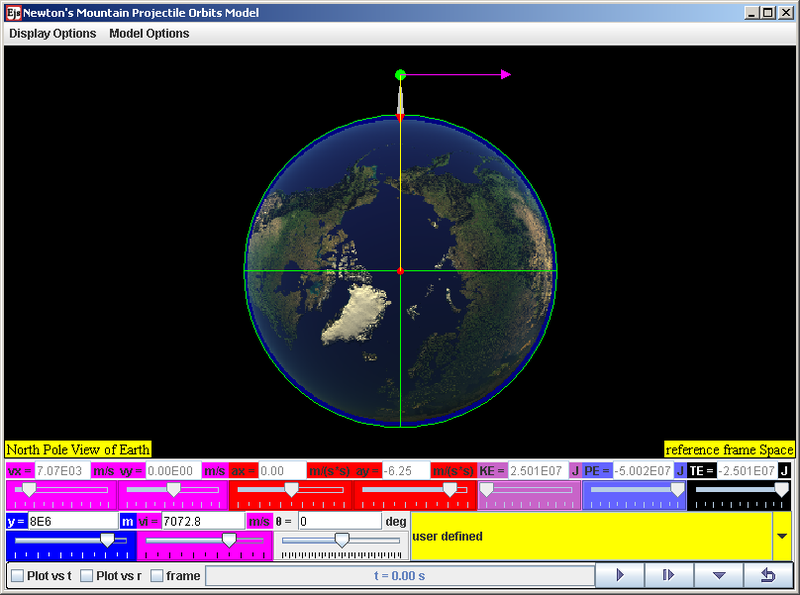 tall mountain, resulting in trajectory orbit that does NOT hit the Earth surface that is a approximately a circular orbit. 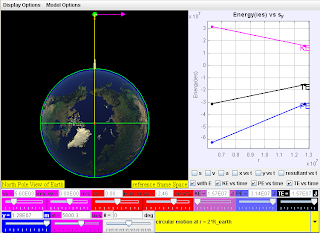 tall mountain, resulting in trajectory orbit that does NOT hit the Earth surface. 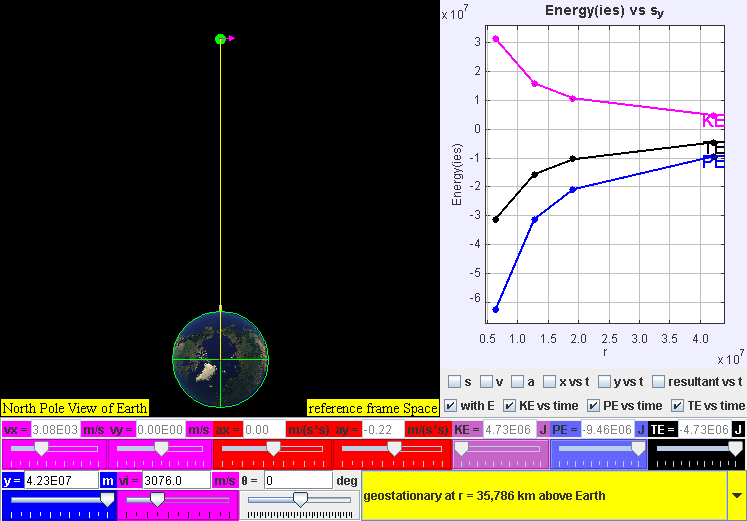 resistance and fell from an orbit of radius 8.0 x 106 m to 7.8 x 106 m.
the satellite during this transition period. This answer can also be verified from the formula relationship on page Newton's Mountain Projectile Orbits which is not intended to be memorized. where the slight difference is due to carry over error from the significant figures of the computer model. 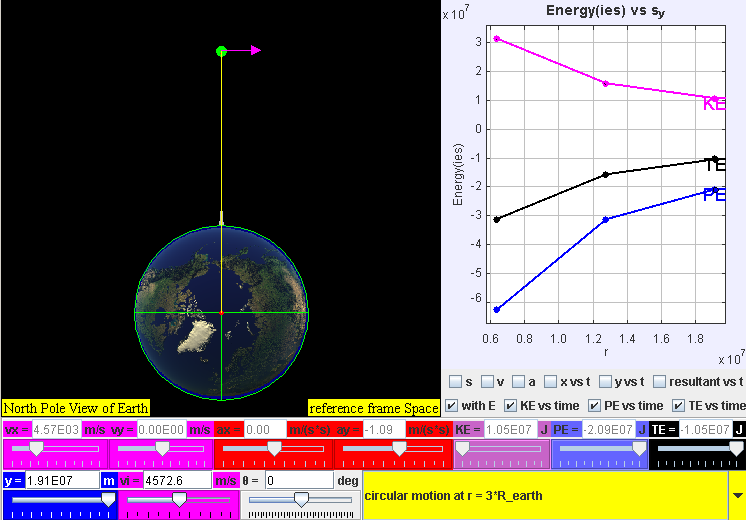 i added the ability to fire and circular from this model space shuttle motion with impulse and added into the model above Ejs Open Source Newton's Mountain Projectile Orbits Model java applet http://www.phy.ntnu.edu.tw/ntnujava/index.php?topic=2204.0 ! 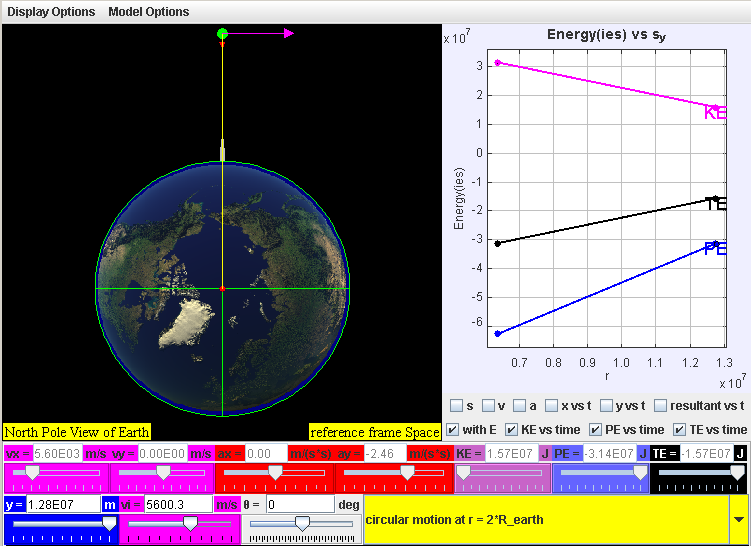 added ability to fire to add velocity to a achieve eclipse orbit and select circular to achieve circular orbit by applying impulse in directions to get velocity at the correct speed and direction, perpendicular to radius. 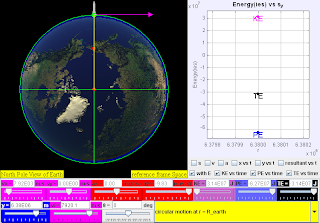 this feature helps in the learning of energies change as satellite move from one circular orbit to another circular as requested by soo kok. many thanks to prof fu-kwun hwang and his physics validated codes to help ordinary teachers make wonderful models for enhanced teaching and learning for the benefit of all humankind!